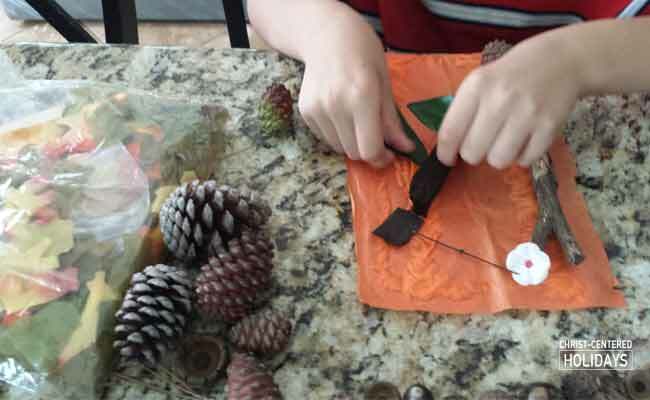 When fall arrives each year we love doing easy fall crafts with our kids, especially fall activities that incorporate natural fall elements such as leaves and acorns. And one of our family’s favorite fun fall activities for kids is to create a DIY fall banner with leaf art animals. Being outside during the fall is awesome! That’s why this fall kids art project is perfect because it combines taking a family walk, doing a simple kids fall craft and then creating a unique, no-fuss fall banner. It’s an easy fall craft for kids that results in one-of-a-kind DIY fall home decor! Your kids will love using their beautiful autumn leaves and other fall nature items to make this adorable animal leaf art fall banner. Check it out below. Easy-peasy, right?! Plus you’ve got the added element of family time and being outside. It’s a great time for quality conversations with your kids. Serve up some apple cider while you’re putting together your DIY fall banner and you’ll be even that much more of a hero. Enjoy this opportunity to have quality conversations with your kids (and make fall family memories)! a good supply of fall leaves, acorns, tree bark, pine cones, pine needles, etc. Step 1: Go for a walk and collect leaves and other natural items. You can make gathering the leaves and other nature items for the fall project as complicated (or simple) as your time allows. Maybe there’s a great trail you’ve been wanting to check out… or maybe a simple walk through the neighborhood is more in order. Either way, just spend a little time with your kiddos outside gathering anything and everything they think is cool! 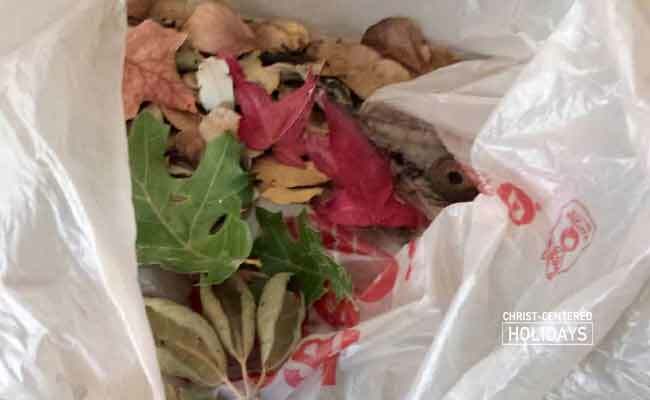 They will use all of these fall nature items as the elements to build little animals or scenes in their animal leaf art for the DIY Fall Banner. Note: If you’re not familiar with animal leaf art, check out these images. It’s also a good idea to give your kids a heads up about what they’ll be making with the items so that they can have some ideas of what to gather. Step 2: Spread out your animal leaf art items and start brainstorming. Examine your items carefully. Does this oddly shaped leaf look like the shape of a bird? Or can you layer all of the elements into a cool pattern or texture? Allow your kids to play with the pieces until they find the animal leaf art or scene they’d like to create for the DIY fall banner. Then, cut an 8 x 10″ piece of tissue paper and have each child glue it to their 8 x 10″ piece of cardboard (use craft glue for this part since hot glue might melt the tissue paper). Once the tissue paper is dry, the kids can begin gluing on each element of their picture to make the leaf art. Some elements (like small pinecones or acorns) are heavier and thus a very strong craft glue (or hot glue) is recommended. Step 3: Make the “happy fall” sign for the DIY fall banner. While the kids are working away on their leaf art animals, you can put together the “happy fall” sign for the banner. First, paint the 4 x 8″ cardboard piece black. You may need to do two coats to make sure that the paint has good coverage. Once the paint is dry (you can use a hair dryer to speed the process along), use a hot glue gun to “handwrite” the letters “happy fall” on the cardboard for the fall banner. Have the jute out and ready as you do this. As you write each letter, glue on a long piece of jute over the hot glue “handwriting,” thus attaching the jute to the cardboard. Only do one letter at a time since the hot glue will dry fast. TIP: When you get to a letter that writes on top of itself (such as a “p,”) don’t make a double layer of jute in that section of the letter. 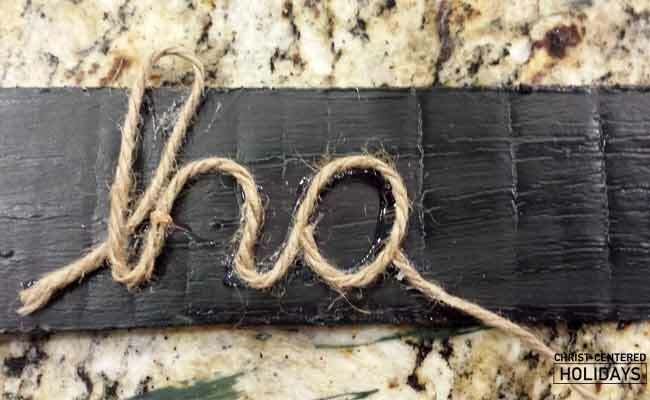 Instead, cut the jute in that spot and jump to the next section of the letter, continuing on. Step 4: Glue it all together and hang up the DIY fall banner. Once the kids’ individual leaf art projects are completed and dried, lay out a piece of ribbon on a table or countertop and arrange the panels on top. Using a glue gun, glue the ribbon to the back of each panel, creating a banner. 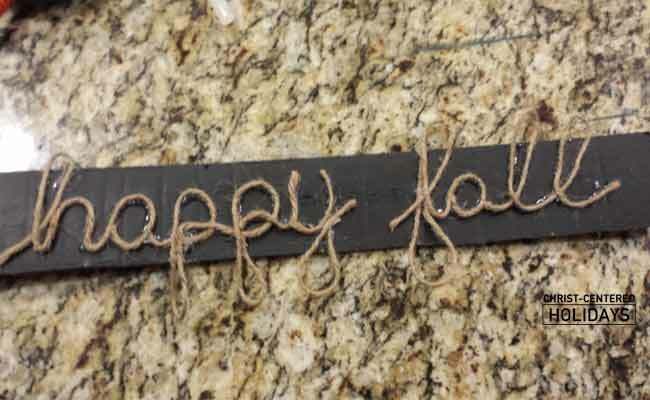 To hang the “happy fall” sign, punch a hole and attach a piece of jute to each side of the sign. Tie the sign and the fall banner to a curtain rod, a mantle, etc. Your DIY fall banner with leaf art animals is complete! Enjoy creating this DIY fall banner as a fun fall activity with your kids!